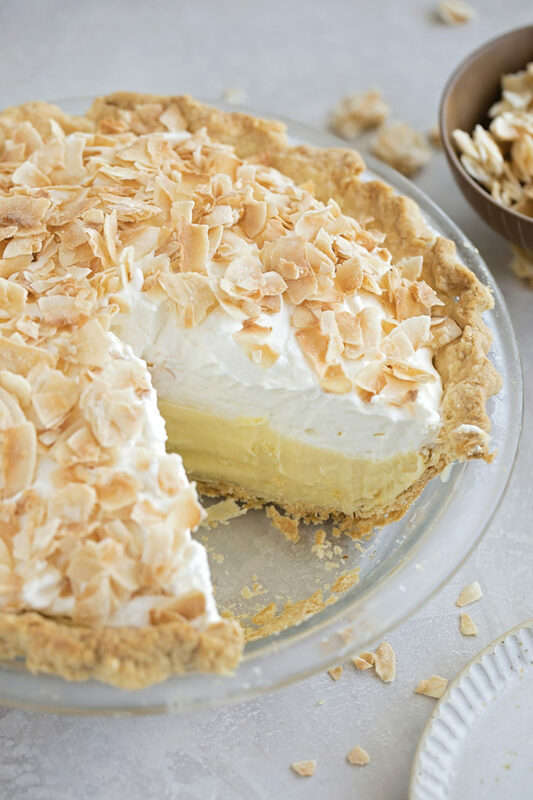 This perfect coconut cream pie is made completely from scratch. 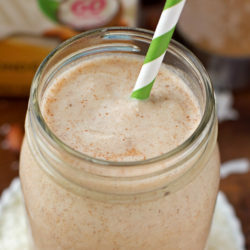 It’s cool and creamy with whipped cream and toasted coconut on top. Coconut cream pie is a classic. It’s sweet, ultra creamy, and absolutely divine! Making pie from scratch isn’t my strong point. 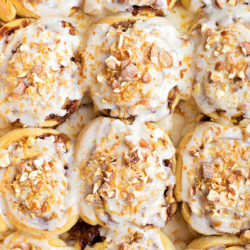 It gives me anxiety, which is the exact opposite of what I normally feel when baking. There’s just something about the crust and the filling that both need to be perfect that really stresses me out. I’m sure I’m not alone! Just ditch the pudding mix and make the custard, ok? 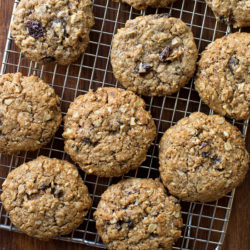 Because it’s pretty darn easy and tastes 100x better than the boxed stuff. It’s kind of the star of the show. I’ll walk you through every step of it. It’s easy, I promise! To start, you’ll want to blind-bake a homemade pie crust (post with step-by-step photos/instructions coming soon, but for now it’s in the recipe card below) and let it cool while preparing the rest of components. The filling is smooth and creamy. No chopped up bits of coconut, because most people can’t stand the stringy, chewy texture of it once its cooked. 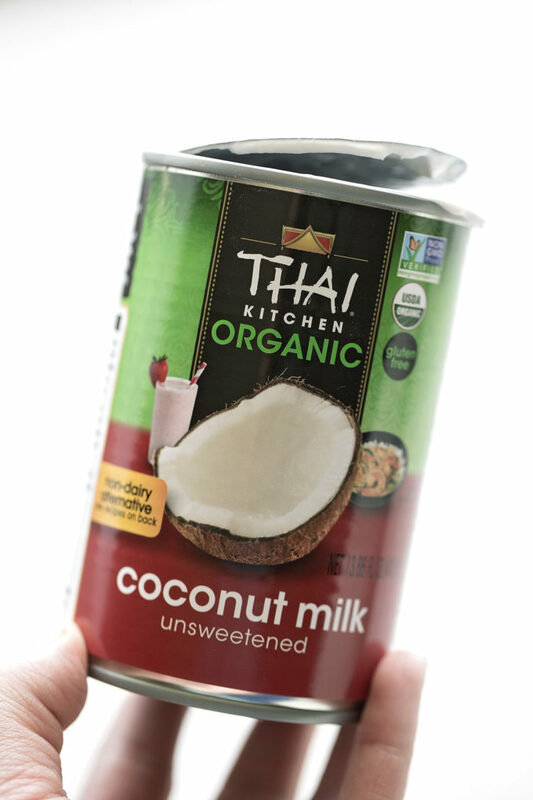 I steep the coconut flakes in the milk mixture to help enhance the flavor of the finished product. Then, I use my favorite pasta clip (it attaches to the side of the pan) to strain the mixture. The strained milk gets gradually poured into a bowl with egg, egg yolks and cornstarch. Since it’s warm, you’ll have to whisk it continuously to prevent the eggs from scrambling. This process is called tempering. Discard the coconut left in the pan, and place the pan back onto medium heat. Gradually pour the filling back into the saucepan and whisk every 30 seconds or so until the mixture thickens. Allow the mixture to cook for about 6-12 minutes until it becomes VERY thick. You’ll have to continually whisk to prevent scorching. If you need to, you can turn down your heat a little. The goal here is to get your filling as thick as possible (as thick as you’d want it for the final product) because you’ll add in butter which will loosen it up. 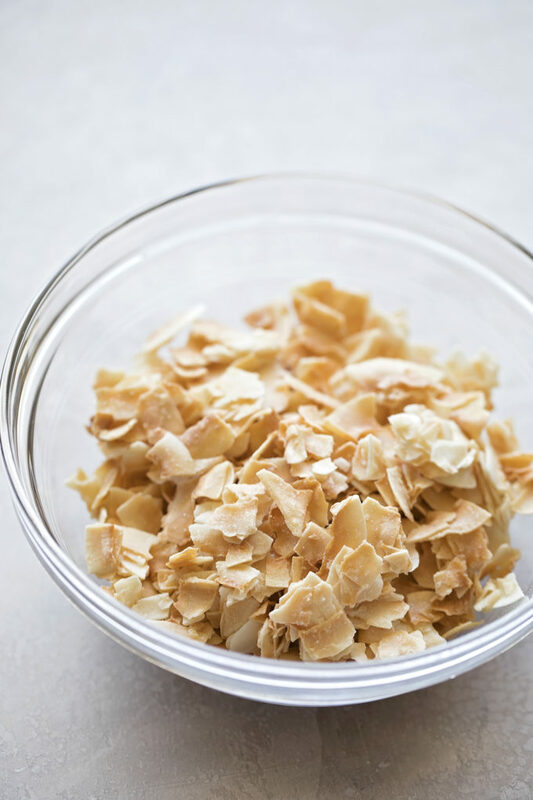 Once the filling has reached the desired consistency, remove it from the heat and add the vanilla bean paste or extract, coconut extract and butter. Whisk for about 2 minutes, then let cool for about 20 minutes. Letting the filling cool will prevent it from softening the bottom of the pie crust. We definitely don’t want to do all of this work and then end up with a soggy bottom as Paul and Mary like to say (Great British Baking Show reference in case you were wondering 😉). Pour the filling into the pie crust and cover it with a piece of plastic wrap, pressing it gently on top of the surface of the custard. Chill for at least 4 hours or overnight. 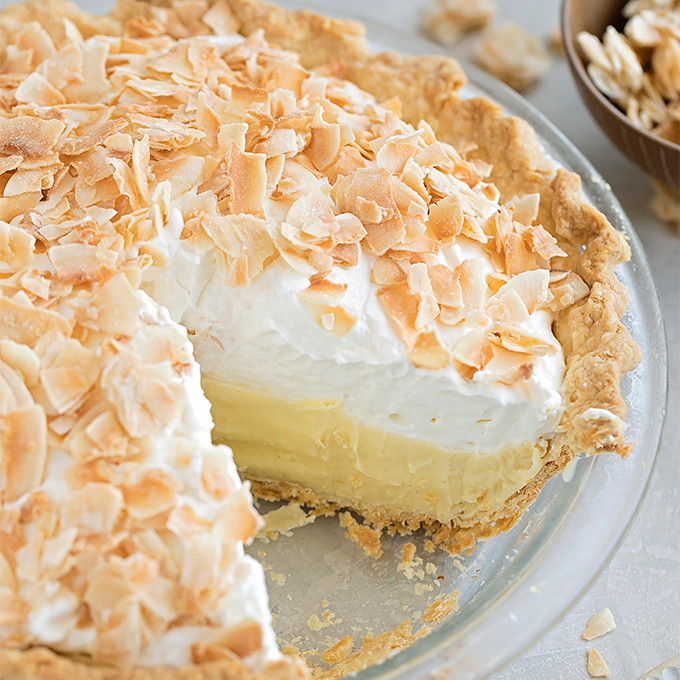 Top with whipped cream and lots of crunchy toasted coconut… the more the merrier. Serve chilled! 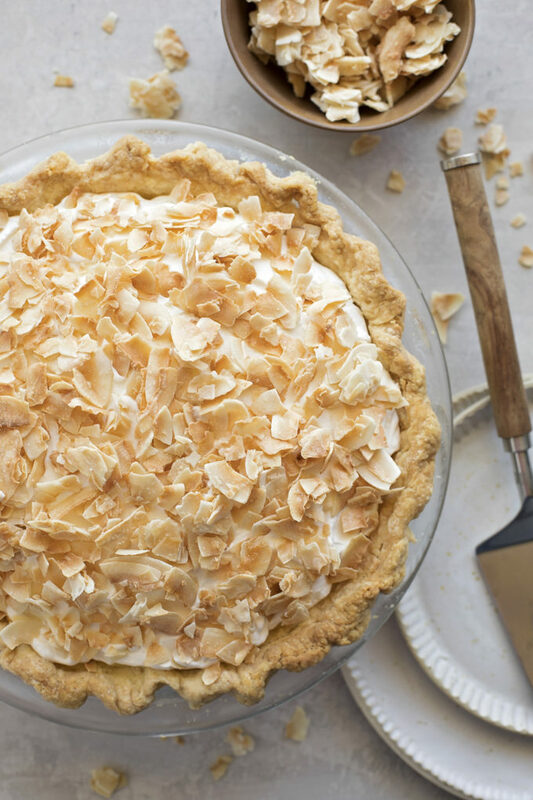 This perfect coconut cream pie is a 10/10. It’s going to be a hit all spring and summer long! We hope you will enjoy it as much as we did! 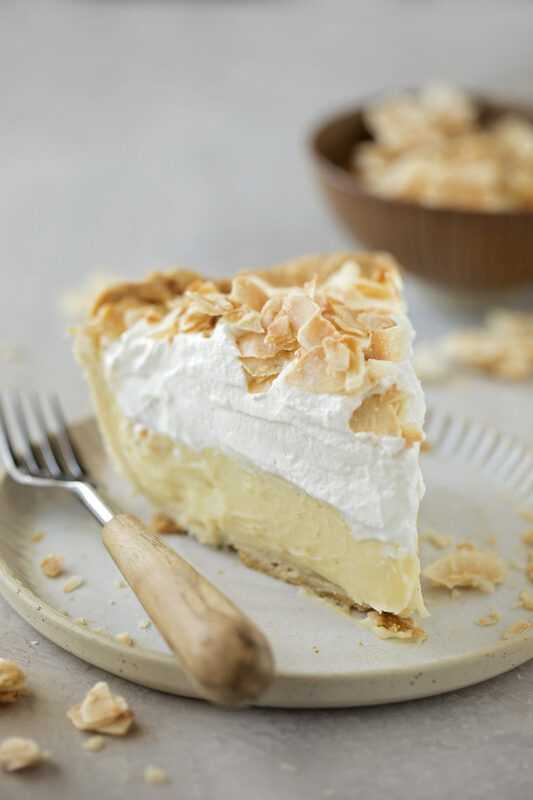 This perfect coconut cream pie is made completely from scratch. It's cool and creamy with whipped cream and toasted coconut on top. In a medium saucepan set over medium heat, add the cream, milk, coconut milk, sugar, coconut flakes, and salt. Bring mixture to a simmer, then turn heat off and let stand for 15 minutes. 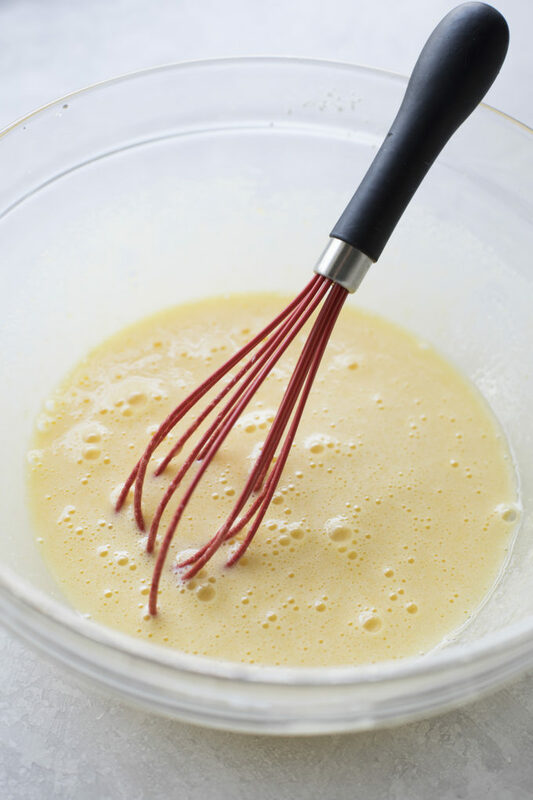 In a medium mixing bowl whisk together the egg, yolks, and cornstarch. 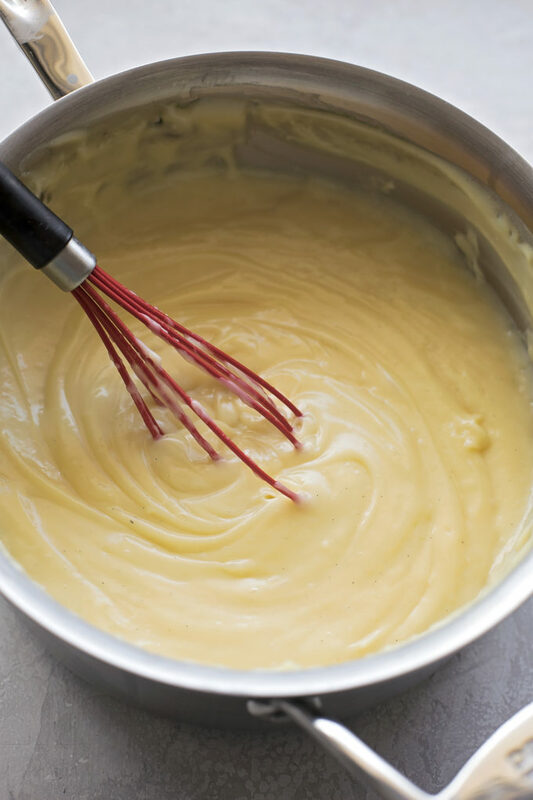 Gradually pour the warm milk mixture through a pasta strainer or sieve and into the egg mixture, whisking vigorously to prevent the eggs from scrambling (this is called tempering). Discard coconut. Once fully combined, return the saucepan to the stove and place over medium heat, pour the mixture back in and heat until it reaches 165 degrees on an instant read thermometer. Continue cooking until the custard becomes very thick, about 6-10 minutes. Remove from the heat and add the extracts and butter, continue whisking for 2 minutes. Let cool for 20 minutes before pouring into baked pie shell. Cover with plastic wrap, pressing on the surface of the custard to prevent a skin from forming. Place in the refrigerator for at least 4 hours, or overnight. In the bowl of a stand mixer fitted with the whisk attachment or a large mixing bowl with a hand mixer, beat the cream, powdered sugar, and vanilla extract until stiff. Spread on to the top of the custard, then top with coconut flakes. Serve cold.